So here is a very different type of trip report. Recently I have been clearing out a lot of things from my childhood, which has included finding a treasure trove of belongings I’d forgotten about, including from a journey I made in 1985 when I was a young kid. I was an airline brat. I didn’t have any particular interest in aviation, but I was lucky to be extremely familiar with it. This particular trip was not long after my dad and mum had divorced. My mum took a trip back to the UK and took me along too. We’d flown over from Australia on a Qantas 747SP to LAX before changing to a British Airways 747. Unfortunately I don’t really remember anything from those flights, I suspect some ‘may make you drowsy’ tablets could have been slipped into my drink! NB: Please note many of the old photos in this trip report are not mine (you can tell mine, they're the really blurry ones). My family had worked for Pan Am since the days of Stratocruisers and enjoyed the fantastic opportunity of working all around the world. Ultimately they settled in Melbourne (Australia), before leaving Pan Am when moving to Sydney. After dad and mum split up, mum ended up seeking part time work out of the industry for a bit, but still very much kept in touch with her former Pan Am colleagues. 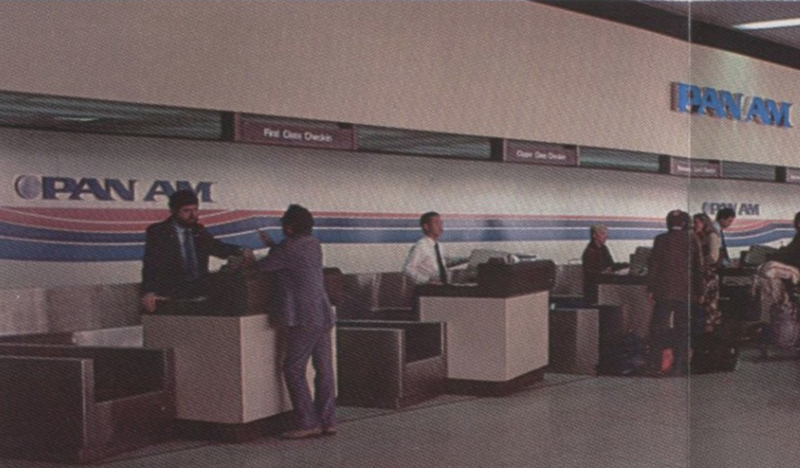 So after checking in, we went to some Pan Am offices at Heathrow Terminal 3. I remember going up what seemed like a long flight of stairs between the check in and arrivals buildings (I maybe wrong). One of mum’s close friends had become management and he took us around various offices where people she knew worked with lots of, “oh where are living now?”. I remember being made I big fuss of, “that can’t be your boy, he’s got so big”. He then walked us through to our departure gate, which was on the distant pier. Along the way they quizzed me on which country airlines came from, I remember there being lots of TWA and Pan Am planes all lined up. My mum’s friend pre boarded us, walking on board and telling the purser who he knew to look after us. The purser was a lovely lady and as I will describe later on, she did look after us. 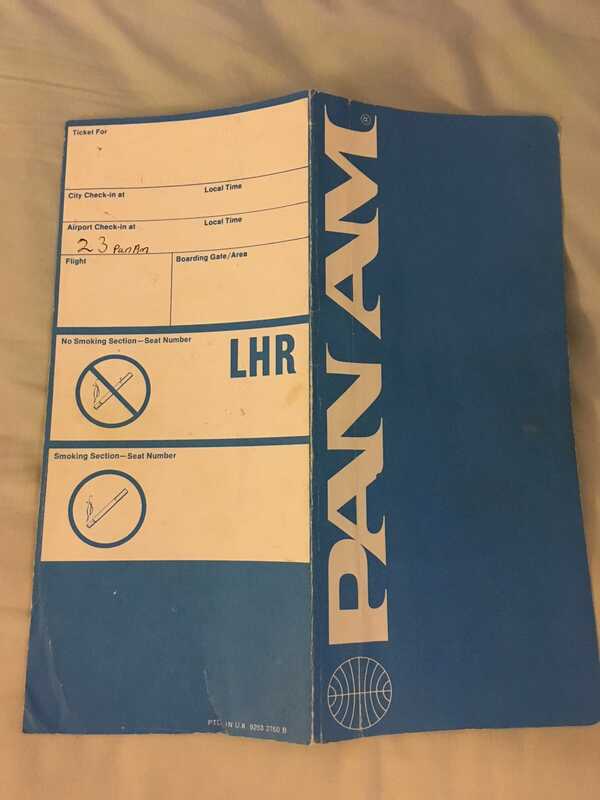 At the time Pan Am was refurbishing their 747 fleet, which was described in the timetable that for some reason got kept as a souvenir. I have no idea if our plane was a 747-100 or 747-200. It was however in the billboard livery, which I remember because I hadn’t seen it before. 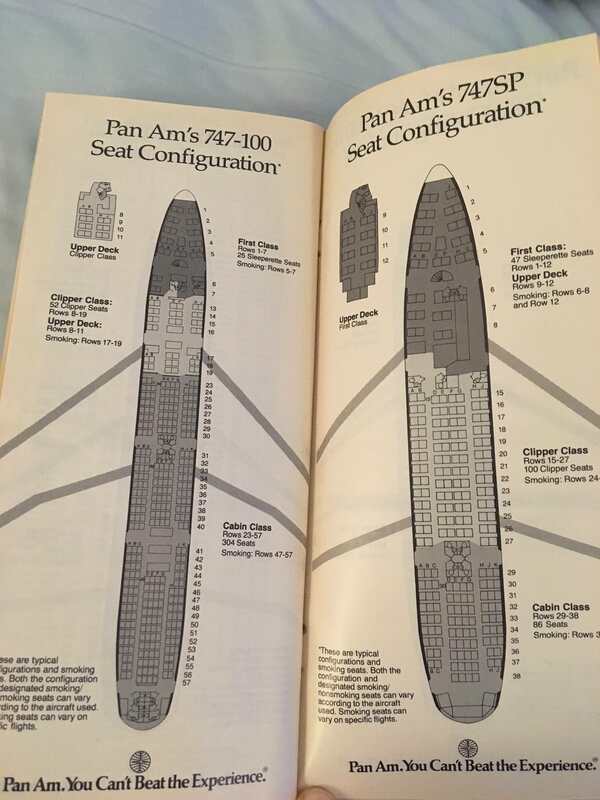 Unfortunately I don't recall where we sat but here is the seat layout for Pan Am's 747 fleet at that time from the same timetable. It had never occurred to think about an aircraft interior before, but the purser and my mum talked about this plane having been refurbished. Bizarrely that led me to remember a lot of detail about it! I remember the seats were covered in a dark blue material, almost purple, with lots of little suns in a lighter blue. The galleys and toilet blocks were covered in a matching dark blue. Some seats had the same pattern, but in a dark orange/red sort of colour. It was all quite smart. Rhetorically, how weird is it that I should remember that? 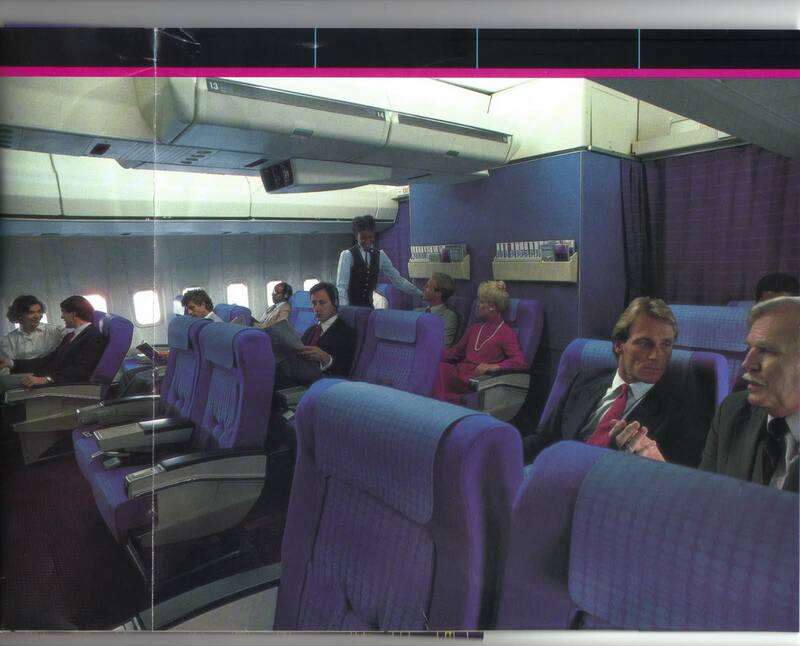 It's quite strange to imagine how much Business Class has changed, most airlines in 1985 had 8 across seating, Pan Am was rather luxurious at 6 across. I remember a lot of cabin announcements about the “Worldpass" programme, where you could earn free flights. As my mum had lost her travel privileges I remember trying to convince her to join it! She told me there was no point as Pan Am weren’t going to fly to Australia anymore. The crew gave me a Pierre Panda kids pack, which I remember had colouring in. I can’t remember anything else about it, but it must have kept me occupied for a little while. When it came to meal time, the crew didn’t serve us saying to wait. A little while afterwards they came down with linen and plates of food from First Class saying loudly, “we’re so sorry your special meals got lost”. Of course there had never been any special meals, they were just looking after us. I think the meal was Chateaubriand, but might be wrong. However, I can tell you that meat melted in my mouth and I vividly remember it was not like the food I’d had before. It was fancy! The purser came around during the movie and sat next to my mum for a chat. They talked about the impending Pacific network sale to United. The purser did not really know if she would go to United or stay with Pan Am. I remember the purser saying that, “Pan Am just won’t be Pan Am anymore”. A real sense of sadness hung over their conversation, “can you imagine Mr Trippe selling the Pacific routes? All because of domestic routes". A genuine disapproval hung over the word ‘domestic’ when either of them said it. 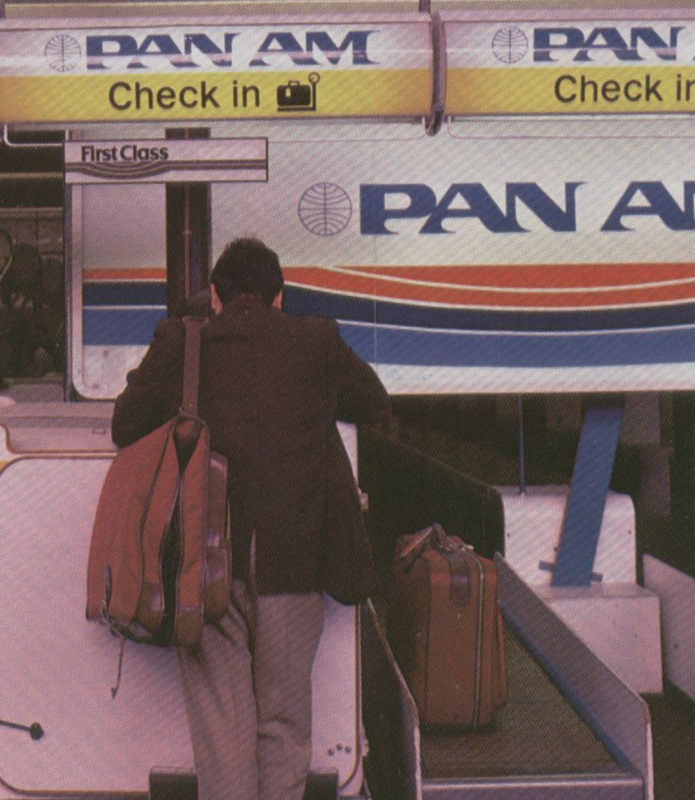 I guess it was the end of Pan Am’s global legacy and in 1985 they still flew pretty much everywhere in the free world. 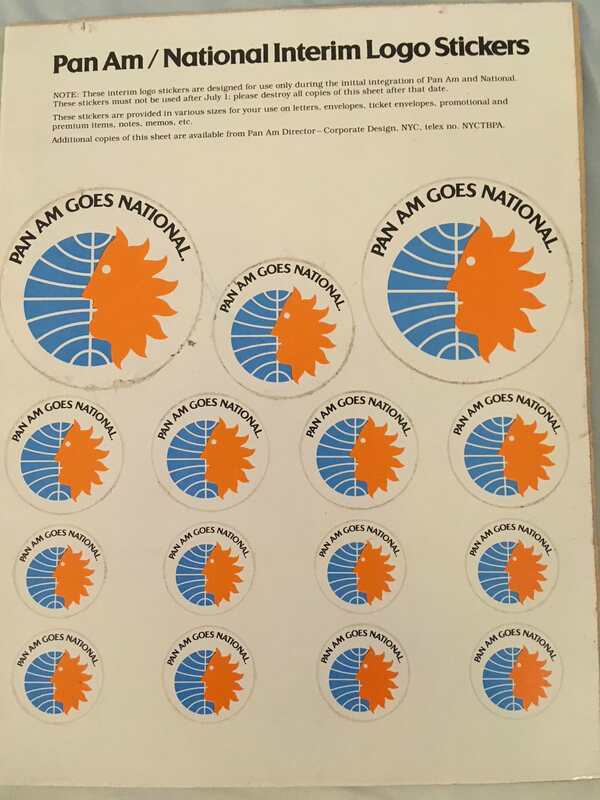 On a side note about airline mergers, when clearing out this year, I found these old “Pan Am goes National” stickers which came from somewhere. I thought to message my mum and let me quote her reply, “Destroy them. That’s where it all went wrong. Foolish men who borrowed too much money. What for? Domestic routes, silly little domestic routes”. 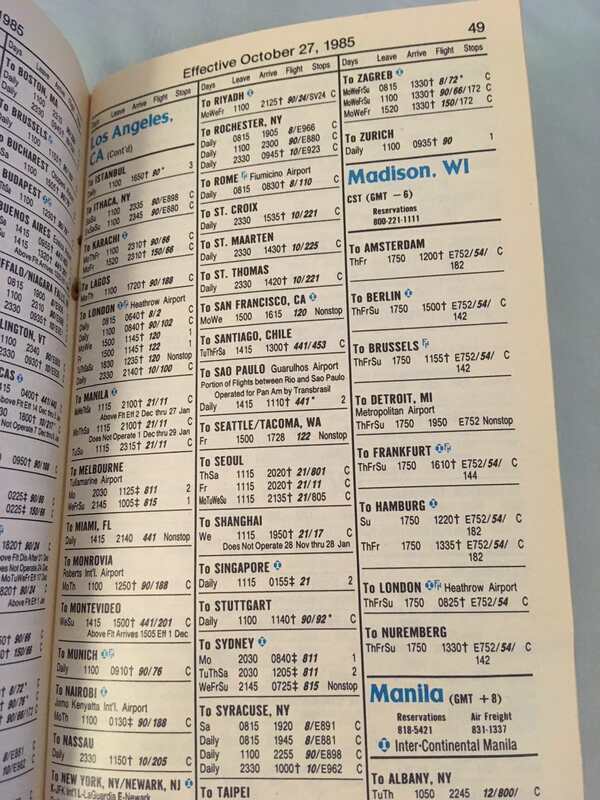 That’s airline mergers for you, 38 years later and they're still bitter…….. Anyway, back to 1985. With all of the blinds down and a grown up movie playing I begun to get restless during their conversation. So the purser took me for a walk around the plane. She showed me the galleys, Clipper Class, First Class and took me up the spiral staircase. One odd detail I remember is that those classes had a different movie playing to economy, not that I can remember what either were. On the Upper Deck she started asking me questions about what we were going to do in America. I told her go to Disneyland and San Diego Zoo. She then told me that you could have breakfast with Mickey and Mini Mouse plus at San Diego Zoo there were Polar Bears. I remember telling her that there used to be a restaurant in the upper deck! She said there used to be but that because planes were busier now they had to put in seats. The purser then took me back to my seat and said in a little while she would take me to meet the Captain. Sure enough she did. I don’t think the visit was terribly long, but it was the first time I’d visited a cockpit in flight. I remember the vast array of overhead switches more than anything. The Captain said it was a simple plane to fly and the switches made it look harder than it was. “Flying this thing is no harder than driving a stick”, joked the purser - which I remember the captain got a little defensive about. I think afterwards my mum might have slipped me a tablet, but woke me up to point out the Grand Canyon. Following that my memory goes a little sketchy. I remember pushing a trolley with two huge suit cases and being in a long customs queue where every bag was being checked. I think the customs guy must have felt sorry for my mum as he just waved us on. Somehow I got the trolley through arrivals without killing anyone (I could only just see over the top) and found the pick up for Anaheim. Here are a few pictures from our stop over. I remember much less about this flight, because it left at almost 10pm. When one of my grandparents in the UK had been gravely ill, my mum had returned about every week and often transited through LAX. So a few hellos were had with some of the ground staff, who didn’t realise she had left. One guy took time to tell me that our flight was on a special plane. It was a newer 747, shorter than a normal one, but that it flew faster than other planes (apart from Concorde) and further too. This was a 747 Special Performance, like a hot rod he said! On boarding I remember this plane seemed older some how, despite being newer. I guess Pan Am had stopped investing in the 747SP fleet as they were going to United. It seemed like something from the 1970s - which I suppose was literally true! It’s just to a kid in 1985, the 1970s were ancient history - right? The seat pattern was identical, but in much brighter ‘flower power’ colours. The seat in front of me was yellow and looked kind of dirty. I didn’t like it.. This picture from the database is of a 747-100, but it’s pretty of similar (you can see the yellow further back). I’ve got very limited other memories of this flight. I remember speeding down the runway but I don't recall taking off, because I fell asleep. At some point during the night my mum must have gone for a stretch because a cabin attendant was sat with me. I just woke up, she smiled and I fell asleep again. The next thing I remember is being woken up by the cabin being sprayed for bugs just before landing. This was standard procedure for Australia at that time. 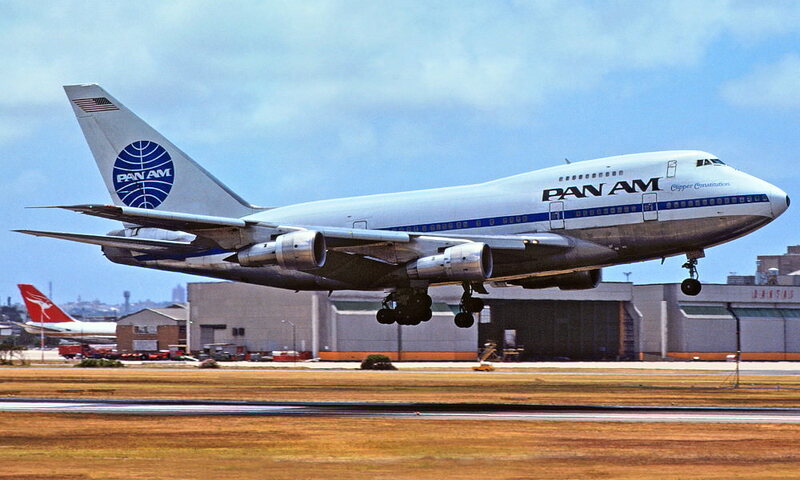 Considering how unusual a Pan Am 747-SP flight was, it is a real shame that I can’t remember more. Alas I can’t. I guess if anything, looking back, there seemed a camaraderie between Pan Am people. Regardless of whether people on this trip knew us well, in passing, or not at all - they all went out of their way because of a common connection. I can't say if most passengers had the same experience, probably not. Anyway, being so young at the time I can’t be sure that I’ve remembered things right. I just thought that maybe by sharing this memory of mine, it might help prompt happy memories for others - or at least provide a glimpse into aviation's past. In case you're wondering, no "Pan Am goes National" stickers were harmed! Thank you for the interesting trip report! I often wonder what would have happened if PA and Republic had merged instead. National really did nothing but bring PA down. I really enjoyed reading this report, so thanks for sharing. Those Pan Am / National stickers must be quite rare. Interesting to see the reaction they stirred up as well - though I am not all that surprised. Buying National for too much money really was a bad move for Pan Am. Excellent that your "special meals were lost" - I'm sure the food you received was really something. Even today, airline staff have ways of treating passengers on board without others obviously knowing what is going on. Excellent selection of pictures too! Nice work! I am curious as to who operated the Madison to Detroit service for connections? Was Republic doing some sort of feed? Thanks for the fond memories. 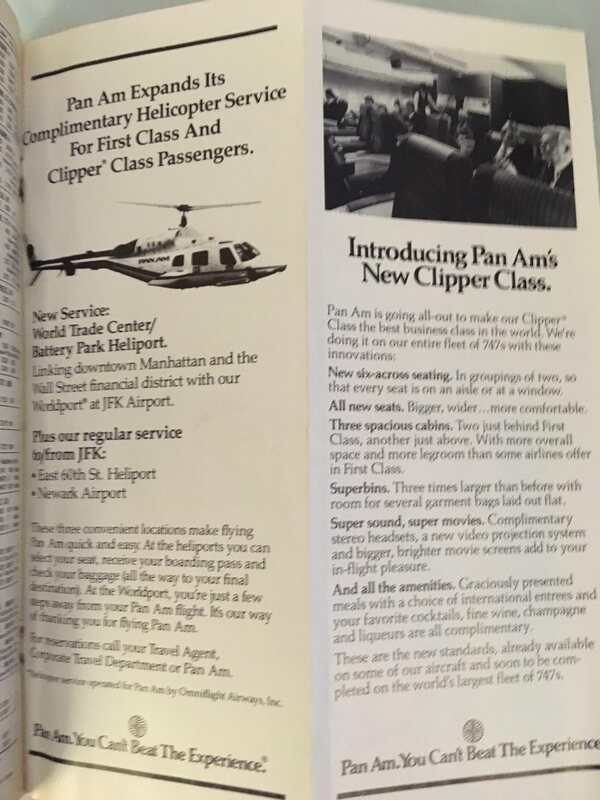 I vividly remember the helicopter service Pan Am had back then too. I really miss the flying from a long gone past somehow I don't find todays flying even remotely enjoyable. I always thought the 747SP was a cool looking airplane too. Had to laugh at the statement the Captain said about flying it is as easy as a stick shift car. My uncle was a former Trans Caribbean pilot who went on to American and retired on the DC-10 my father said he could never drive a stick shift car but was a captain on the DC-10 lol..
Wow. I grew up in Brazil but am German and my father used to work at an American company back then. We flew Pan Am from Rio to meet my grandparents in Germany, Hamburg to be specific. It was all back in the eighties. I remember the lights of the cinema in the 747. Because we were four and later five, we were always seated in the middle. I remember changing in NYC but getting stuck there. It all changed after Lockerbie and due to some company regulation we flew Lufty afterwards. I don’t have anything specific in my mind anymore but this made me smile a lot. Nice trip report and bringing back fond memories of childhood aviation interest. I enjoyed seeing the Timetable. Haven't seen one in years. LAX was my home base, and back then you could actually go the gates to meet arriving relatives. 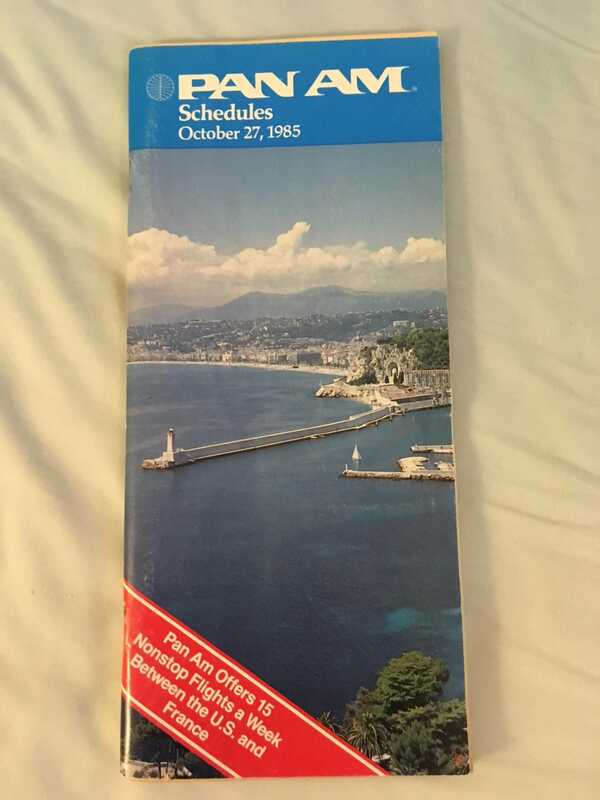 Everytime visiting I'd always grab the timetable to study it. I flew Pan Am only once on a 747 and that was an experience. LAX-JFK redeye. A plane full of Russian travelers that didn't understand instructions for remaining seated during takeoff, a bunch of folks got up to check their overhead luggage as plane was ascending. Also, got to love the smoking section. On that plane, the entire economy section was really the smoking section! LOL I used to love the timetables. No more. And the IAG book of world timetables. I flew First to Honolulu in 1986 and got the free helicopter from New York and a limo to the heliport! All with air miles. Also flew Business on the SP. However the food on Pan Am in economy was really the worst. You would get Swiss Miss chocolate pudding. LOL. Flew them in 1977 to Hong Kong. Very mediocre in economy. "I think afterwards my mum might have slipped me a tablet" could be the best line from any trip report EVER!!! Great TR thanks for the enjoyable reading. Ah yes, the stethoscope headsets. I had forgotten. 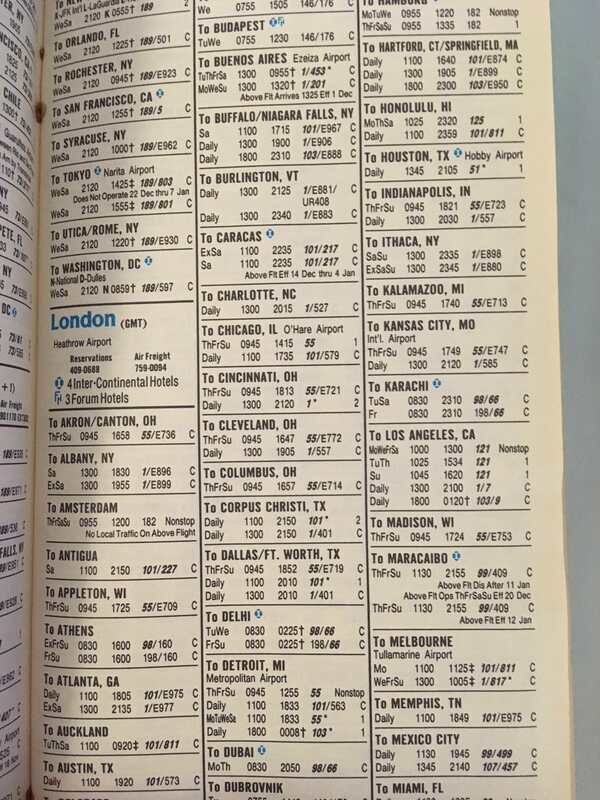 I've still got boxes of airline timetables. A helicopter from Manhattan must have been a great start to a Hawaiian trip. Thank you. Kind of seems backward that today a LAX-JFK redeye would probably be on a narrowbody. I'm really glad that it brought back a few memories for someone else. That was what I hoped for. A pleasure. Certainly flying back then had a very different feel about it. Thank you. I'm not sure about Republic. Thank you. The National deal didn't really work for anyone in the end, Republic would certainly have added a lot stronger presence in the interior. Wow, amazing. I was born on October 15, 1985. PAA did the Forces Charter Rest & Recuperation (R&R) flights from Saigon to Sydney return during the Vietnam War on 707's. I was on one such flight just after the TET offensive in Feb 68 returning to Saigon, left around 9am and I still remember the lunch that was served on board. Steak and veges. The steak was the best I have ever had, just melted in the mouth. Pure yummy. Nice to read a different kind of TR. I also have boxes of aviation magazines, postcards, pictures and timetables from the early 2000s when I was a kid. I used to love reading and examining those timetables. 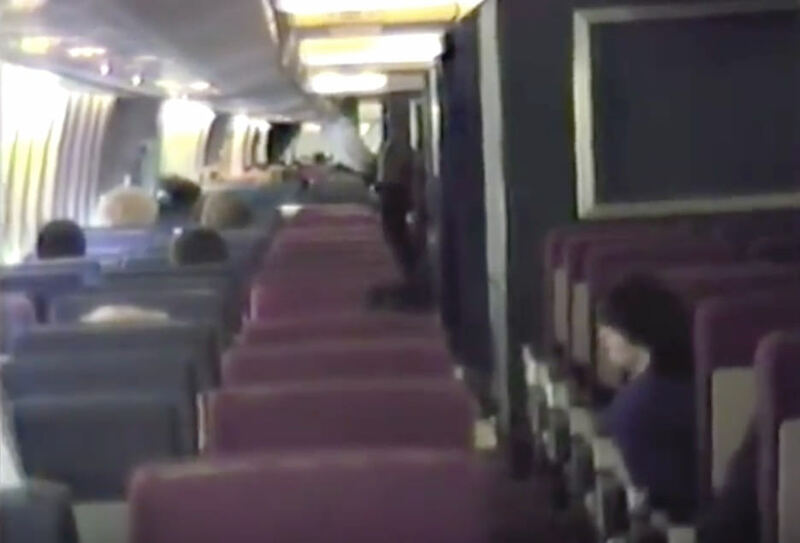 My only flights on Pan Am were in 1989 and 1990 (HAM-(LHR)-JFK-MIA, and back, in 1990 one was MIA-LGA with a transfer to JFK), and as I was only 9 and 10 back then, I remember many little details (and collected a timetable I still have), but not clear, comprehensive story. I remember how excited I was on the return JFK-LHR to finally fly a 747 (the outbound was HAM-JFK on an A310, I was sooo disappointed), and how disappointed I was, that it a) had the old cheat line livery (as a kid, I thought those were the „old ones“, the - newer - looking bildboad-livery planes newer; Lockerbie was just a few months prior, and I had noticed, that it also had the old livery and was supposed to be 19 years of age) and b) upon entering, about how shabby the interior appeared to me (by 1989 it probably was).